Shown in the photo: L-R Front Row: Kah Walla, Karla Ruiz Cofino, President Bill Clinton, Yin Myo Su, Amira Yahyaoui, Samar Minallah Khan. L-R Back Row: Sally Field, Susan Davis, Kailash Satyarthi, Ambassador Melanne Verveer, Sara Blakely, Diane von Furstenberg, Ambassador Bill Burns, Donna Langley, Alyse Nelson, Monica Mishra, and V. Sue Molina. 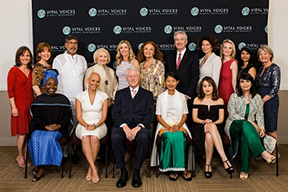 President Bill Clinton, Founder of the Clinton Foundation and 42 nd President of the United States, recently was part of the 14th Annual Vital Voices Global Leadership Awards to celebrate five trailblazing women from across the world who are fearlessly working to transform their communities, and inspire a new generation of global leaders to seek innovative solutions to the most dire problems. Distinguished presenters, including Nobel Laureate Kailash Satyarthi , designer and longtime Vital Voices supporter Diane von Furstenberg, honored Cameroonian political leader Kah Walla, Myanmar conservationist and entrepreneur Yin Myo Su, Pakistani anthropologist and filmmaker Samar Minallah Khan, Tunisian activist Amira Yahyaoui, and Guatemalan entrepreneur Karla Ruiz Cofiño. They each demonstrated conviction in their goal to empower the citizens of their country in unprecedented ways, implement long lasting change, and inspire future leaders. The program also featured appearances by Vital Voices Board Chair Susan Davis, Universal Pictures Chairman Donna Langley , Spanx founder Sara Blakely, Academy Award-winning actress Sally Field, Carnegie Endowment for International Peace President Bill Burns, Ambassador Melanne Verveer, and others. In recognition of the 20th anniversary of the United Nations Fourth World Conference on Women in Beijing, Vital Voices presented a special edition of the Vital Voices Global Leadership Awards, called the Vanguard Award, to each honoree. This distinction honors a woman with a daring vision for the future. An innovator, she takes risks and turns lessons learned from the past into bold, creative solutions for tackling the world’s toughest challenges, leading the way toward progress and opportunity for all.